Cheltenham’s £100,000 Grade Two Argento Chase, run over three miles, one and a half furlongs, is the highlight of Cheltenham’s Festival Trials Day on Saturday, January 30, 2010 - the final day of racing at Prestbury Park before The Festival in March. The Argento Chase, due off at 2.35pm, often has a strong influence on the chasing championship, the totesport Cheltenham Gold Cup. Last season, the Colin Tizzard-trained Joe Lively rallied gamely to see off Halcon Genelardais in a high-class renewal, with Tidal Bay clinching third spot. The 2008 race saw Neptune Collonges finish third to Knowhere prior to filling the same berth behind stablemates Denman and Kauto Star in the totesport Cheltenham Gold Cup, while runner-up Our Vic went on to Festival glory in the Ryanair Chase. Neptune Collonges subsequently landed a pair of Grade Ones in Ireland before finishing fourth to Kauto Star in the 2009 totesport Cheltenham Gold Cup. In 2007, Cheltenham specialist Exotic Dancer was successful prior to finding only Kauto Star too good in the totesport Cheltenham Gold Cup. Three of the last 14 runnings of the Argento Chase have generated the winner of the totesport Cheltenham Gold Cup in the same season. The 2000 Argento Chase was won by the Noel Chance-trained Looks Like Trouble, who returned to Prestbury Park two months later to capture chasing’s top event. The 1999 renewal saw See More Business, who had been successful in the 1998 Argento Chase, finish third to Cyfor Malta and the Paul Nicholls-trained chaser then captured the totesport Cheltenham Gold Cup. See More Business also landed the Argento Chase in 2001 but was denied the opportunity to win the Gold Cup again when that year’s Festival was cancelled because of the foot and mouth outbreak. 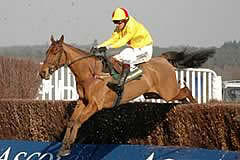 The fine chaser ran well to be third in the 2002 totesport Cheltenham Gold Cup. One Man triumphed in the 1997 Argento Chase, the first occasion that the great chaser won at Cheltenham and, after his sixth in that year’s Gold Cup, he returned to Prestbury Park in 1998 to win the Seasons Holidays Queen Mother Champion Chase over two miles at The Festival. The 1995 Argento Chase went to Master Oats, who beat the previous year’s heroine Dubacilla by 15 lengths. The pair returned to the course two months later to compete in the totesport Cheltenham Gold Cup, filling the same positions and by exactly the same margin. The other races on Saturday, January 30, are headed by the £50,000 Grade Two Betfair Cleeve Hurdle (3.45pm), which was increased in distance to three miles in 2005, having previously been run over an extended two and a half miles. Last season, a fantastic renewal saw Big Buck’s defeat odds-on favourite Punchestowns by four lengths. The pair filled the same positions when renewing rivalry in the Grade One Ladbrokes World Hurdle at The Festival. In 2008, Inglis Drever powered to a five-length victory over Blazing Bailey before going on to take an unprecedented third Ladbrokes World Hurdle at The Festival. The Howard Johnson-trained gelding had finished a four-length runner-up to Blazing Bailey in the Cleeve Hurdle 12 months earlier. Lady Rebecca made the Betfair Cleeve Hurdle her own from 1999-2001. There was hardly a dry eye in the house when Venetia Williams’ fantastic mare came up the hill to win well in 2001 to complete her treble. The calibre of the Betfair Cleeve Hurdle winners is exemplified by Large Action, twice placed in hurdling’s top event, the Smurfit Kappa Champion Hurdle (third to Flakey Dove in 1994 and runner-up to Alderbrook the following season). Flakey Dove herself had won this contest in 1994 under a fine ride from Richard Dunwoody for Herefordshire-based trainer Richard Price, less than two months before she took her place in racing history at The Festival. The seven-race programme on Saturday, January 30, begins at 12.55pm with the £27,000 Grade Two Betfair Finesse Juvenile Novices’ Hurdle. 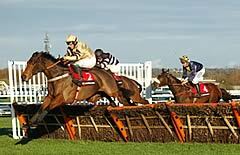 One of the top races of the season for juvenile hurdlers, it was won in 2007 by Katchit, who returned to Cheltenham to collect the JCB Triumph Hurdle at The Festival before going on to victory in the Smurfit Kappa Champion Hurdle 12 months later. Katchit’s trainer Alan King also saddled 2008 winner Franchoek, who went on to finish second in the JCB Triumph Hurdle at The Festival and the trainer notched a hat-trick in the race when Walkon repeated that feat in 2009 - the gelding was a close second to Zaynar in the JCB Triumph Hurdle. The £22,500 Timeform Novices’ Handicap Chase follows at 1.30pm. Lacdoudal, successful in 2005, progressed to win the Betfred Gold Cup at Sandown the following season. La Landiere, trained by Richard Phillips, landed a five-timer in the 2003 renewal and she then followed up in the Racing Post Chase at Kempton and the Cathcart Chase at The Festival. The previous year’s running went to the powerful combination of Martin Pipe and Tony McCoy thanks to Royal Auclair, who also subsequently captured the Cathcart Chase at The Festival. Ping Pong Sivola was runner-up in the Freddie Williams Festival Plate after winning last year’s contest. The £50,000 Grade Three Betfair Trophy Chase (2.05pm), a handicap over two miles and five furlongs, has been won by plenty of very good chasers including Lady Cricket (2003), Foly Pleasant (2002), Young Spartacus (2001), Papillon (1998), Dublin Flyer (1997), Couldnt Be Better (1995) and Waterloo Boy (1994). The £27,000 Grade Two Neptune Investment Management Novices’ Hurdle (3.10pm) was run on Festival Trials Day for the first time in 2005, when won by the French-trained Ambobo. The contest was previously staged at Uttoxeter and has been won by future Festival winners Iris’s Gift in 2003 and Monsignor in 2000. The 2007 victor Wichita Lineman went on to success at The Festival in the Albert Bartlett Novices’ Hurdle, while the third Massini’s Maguire was also victorious at The Festival in what is now the Neptune Investment Management Novices’ Hurdle. Diamond Harry took the spoils in 2009 before losing his unbeaten tag when third to Mikael D’Haguenet at The Festival. The £18,000 Stellar Football Handicap Hurdle (4.20pm), run over two miles and a furlong, concludes the racing action. Saturday, January 30, is the last day of racing at Cheltenham before The Festival on Tuesday, Wednesday, Thursday and Friday, March 16, 17, 18, & 19.